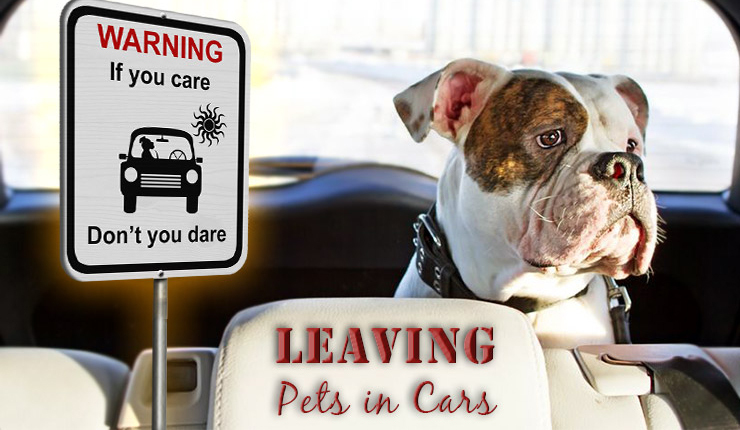 Leaving Pets in Cars: If You Care- Don’t You Dare! It's summertime! And that means, among other things, that the weather is getting considerably warmer. With the temperature peaking at an alarming rate, it’s important that we remember to stay safe from dehydration, heat stroke, and other conditions that threaten our health in the summer swelter. What's equally important, however, is that we remember to protect our pets from the heat and these particular health risks. Though many pet owners are aware of this need and provide their pet with plenty of support to get through the heat, many others unwittingly subject them to further danger. It’s not uncommon to run into a store and leave a pet behind in the car; many times, this can prove to be a completely harmless practice. However, in the heat, leaving your pet to sweat it out in the summer heat can prove deadly. We know that cars left in the sun can get hot- but often that takes time. If you left your dog in the car for mere 10 minutes on a day when it was fairly cool- then there should be nothing to worry about, right? Unfortunately, this line of thinking is exactly what puts dozens of dogs in danger every summer season. Owners are often lulled into a false sense of security on cool days, in particular. In reality, their cars conduct heat and prevent its dissipation by design. When the temperature is a mere 70 degrees Fahrenheit, just 10 minutes in your car could be devastating to your dog’s health. The initial 10 minutes allows the heat to rise to a sweltering 89 degrees; after 30 minutes, the seemingly harmless temperature of 70 degrees has heated the interior of your car to a whopping 104°F. This figure only becomes even more shocking as the weather gets warmer. As the chart shows, 30 minutes in the interior of a car is long enough to reach devastating heats; and, in a mere 10 minutes, the car’s temperature can rise nearly 20 degrees. The speed at which this heat increases means that it’s vital that we never leave pets in the car at all. Even a five-minute run to grab a single item in the grocery store can be halted by unexpected delays- and even a five-minute delay can prove deadly on a hot day. Ideally, we would bring our pets everywhere with us- but this simply isn't always practical. For the safety of our pets, it's imperative that we ensure that they are always in a safe place. This is no simple task- it requires planning and forethought to ensure that our pet is in a proper position to enjoy your company while travelling. Rolling down your window may strike you as a satisfying method of protecting your pooch- but it won’t completely negate the rising temperatures. Instead, bring your pet with you if you need to run a quick errand. If this proves impossible due to a store’s policy or other limitations then it might be best to simply leave your pet at home. We hope that this information helps you keep your pets safe this summer. Please share these tips with pet owners you know to ensure that their pets stay safe this summer!